Whether you’re a self-builder, an architect or a building contractor, we’ll give you the technical and practical support you need to incorporate our frame into your build. 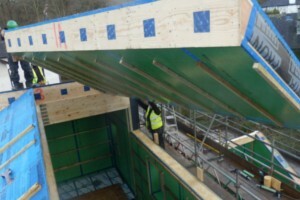 Your frame will be one of the most important parts of your energy-efficient building and we’re here to advise and support you as you plan your project, get your site ready for your frame and finish off your building afterwards. Whatever stage you’re at in planning your project, it’s never too early to have a chat with us. We find that most people contact us after they’ve engaged an architect and have initial designs and planning permission, but we welcome enquiries at any point. At the planning stage, we can help you fine tune your architectural plans. After many years’ experience of constructing energy-efficient buildings, we’re well placed to spot any issues in the design that could potentially lead to higher build costs where your frame is concerned. We can also advise on ways to improve the design for energy efficiency and airtightness. For example, we sometimes spot potential cold bridges in the design or ways to simplify the external structure to reduce your build costs. We’ll work with your build team to help you factor energy efficiency into your project from the very earliest stages, which is the best way to keep your costs to a minimum and produce the best possible building for you. Most of the building contractors we’ve worked with over the years hadn’t had the chance to work on a Passivhaus or energy-efficient building before. 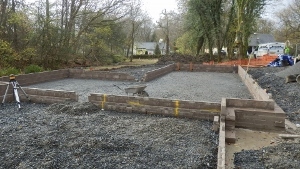 We understand the whole construction process, not just our part of it. 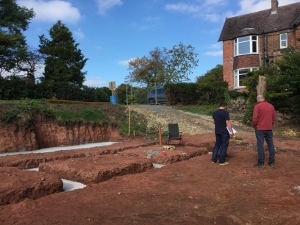 Our experience means we can guide your construction team – from getting the ground works right for your frame through to finishing off your building afterwards in a way that maintains your airtight shell. We’ve even managed to convert a few contractors to the energy-efficient way!